Oxford Flow, the pressure control equipment specialist for the municipal water, natural gas distribution and industrial process industries, announces recently that it has been awarded the NSF/ANSI 61 and 372 accreditation for its polymer water pressure regulating valve (PRV) range. 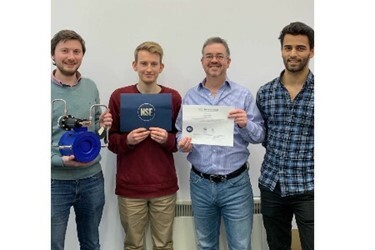 Oxford Flow designs and manufactures innovative pressure control equipment using technology developed at Oxford University in the UK. Engineered to be smaller, lighter and more reliable than competing technology, Oxford Flow’s pressure regulating, sustaining and reducing valves (PRVs) and gas pressure regulators can significantly reduce costs for energy, water and process industries.